Color is like temptation, difficult to resist. This is true even for hairstylists, who through experimenting with new cuts, colors and styles, satisfy their need to express their individual creativity. 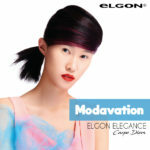 Nancy Lin, Technical Educator at Elgon Taiwan, loves to experiment on herself. Nancy has hair that is extremely robust and difficult to bleach, yet she loves pastel shades. To avoid stressing and damaging her hair, Nancy uses Link-D, the reconstructive Elgon treatment that maintains the health, vitality and body of the hair, ensuring fabulous color in no time at all. “For photo shoots, the looks created have to be better than perfect and we frequently have to bleach and color the model’s hair. But that’s not all! Often, the same model is used for several images with different looks. The hair cannot lose its strength and beauty. Link-D, in these cases, is a powerful weapon. I always use it, even in the salon, since it restructures the hair and restores the vitality that we otherwise risk losing. The active ingredients in Link-D don’t just work on the hair’s exterior but also penetrate right to its core. I wholeheartedly recommend it”. BOND SEALER N°4 binds the amino acids present in the formula with those of the hair cuticles, blocking humidity and preventing the color from fading.